This morning I was sorting through the photos in preparation for a post about last weekend's Sydney International Spa & Beauty Expo and I found a surprising amount of photos on my phone which I'd planned on uploading to Instagram and never got around to. I have a very limited data plan on my phone which means it's mostly offline. I try to connect once a day for a 5 minute scan through IG and to upload a pic if I have one ready. I love looking at everyones photos but often the connection is so poor I can't get anything to load and my upload fails. All which means I ended up with a backlog of photos to share. I can connect at home with wifi but I dump my phone when I walk in the door so it usually doesn't occur to me. This morning's sorting reminded me of all the photos I didn't share so I connected my poor neglected phone and posted a bunch of pics to IG. Apologies to anyone who follows me on IG or my personal Facebook, it was spam city for a while there, and to complete the abuse I'm going to share the same pics here in one big disorganised blog post, along with some other long lost pics which may have made it to IG but not the blog yet. Most of these I'd planned to have a dedicated post for, with multiple shots and a review of the polishes used but there's just too many for that now. Powder Perfect Kevin! This is so sparkly in the sun. Sayuri Sugar Coated Dreams. Wish I could remember what I used for undies. 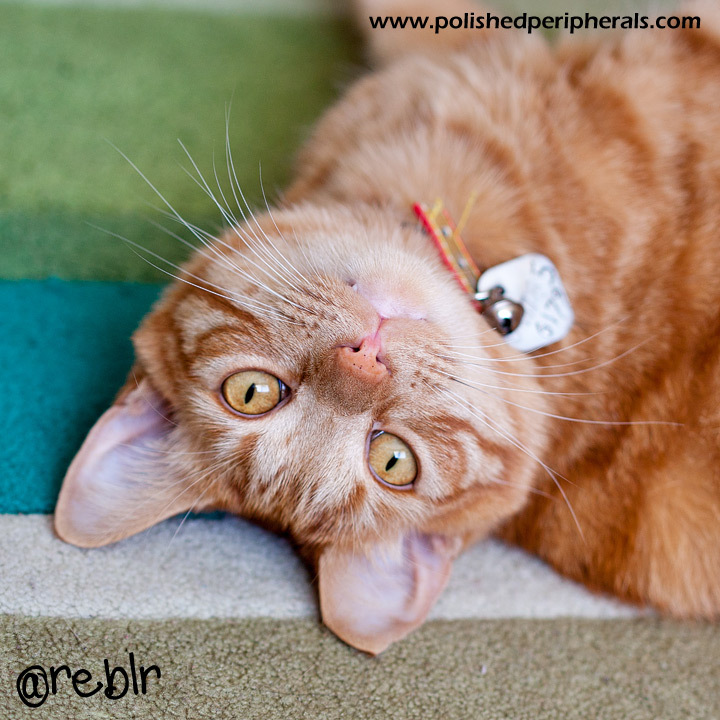 Novel Nail Polish Tigers on a Gold Leash, it's a thermal, this is the warm colour. Novel Nail Polish Tigers on a Gold Leash, with cold tips. It's a really stunning colour change. 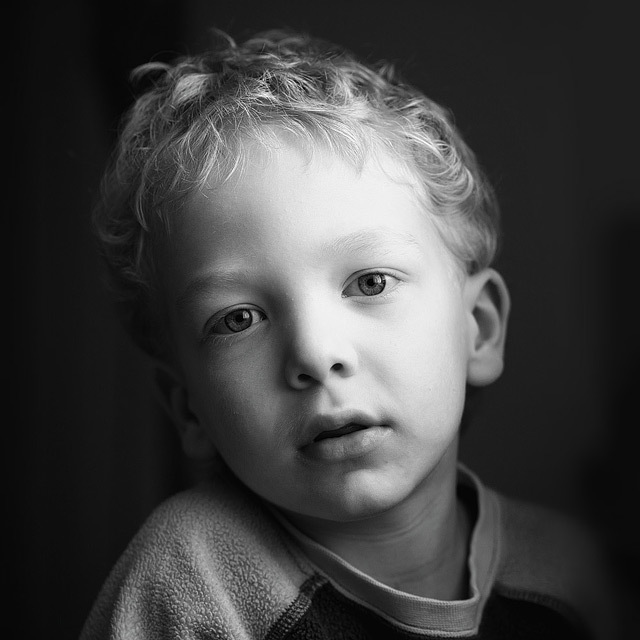 interlude: this is Ben, my youngest son. This is a cat. His name is Data and he likes food, food and long belly rubs on the rug. 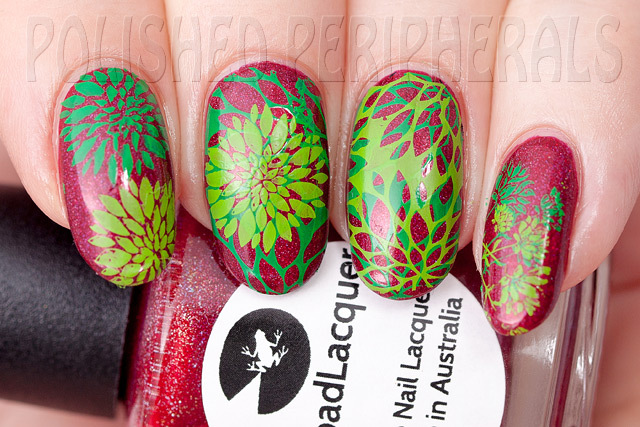 More stamping practice with Messy Mansion plate MM27 over Shades of Phoenix Larcarnum Inflamareae. Stamping with Moyou London plates and mostly Ulta3 polish. Congratulations if you made it this far. This isn't all of them but I think it's enough for today. I'll leave you with some rather lovely plates. OK so they aren't actually stamping plates. 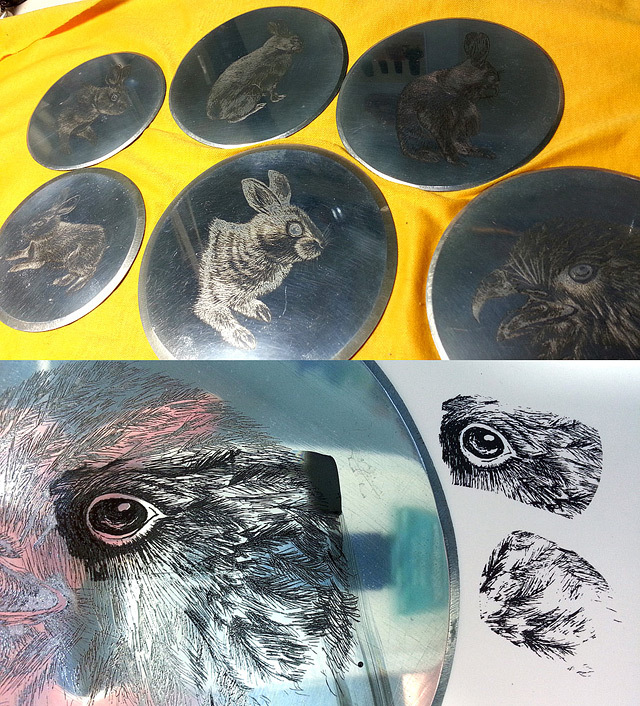 They're some etching plates I made at school, waaaay back in the 80s, but I dug them out and tried them for stamping. 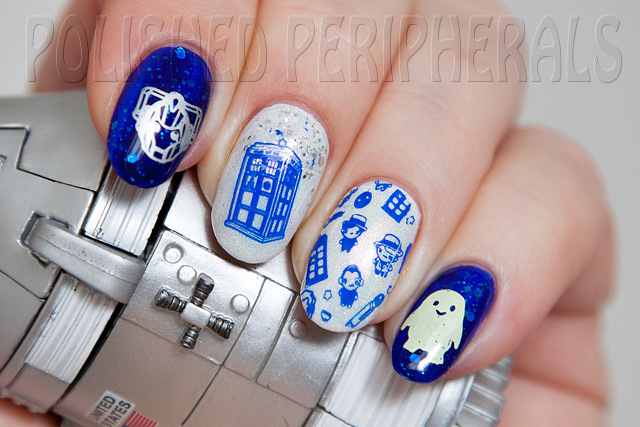 They work surprisingly well but the images are way too big to make sense on my nails. It's that time of year again. piCture pOlish's Blog Fest is here. 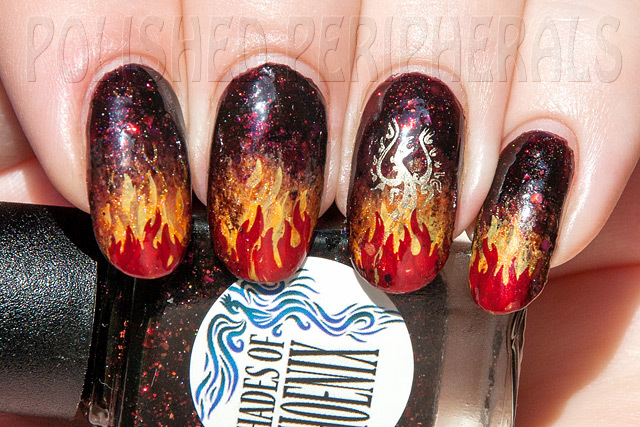 The day nail bloggers all over the world showcase piCture pOlish swatches and nail art. This is my third year participating. If you want to see my previous contributions here's 2012 and 2013. 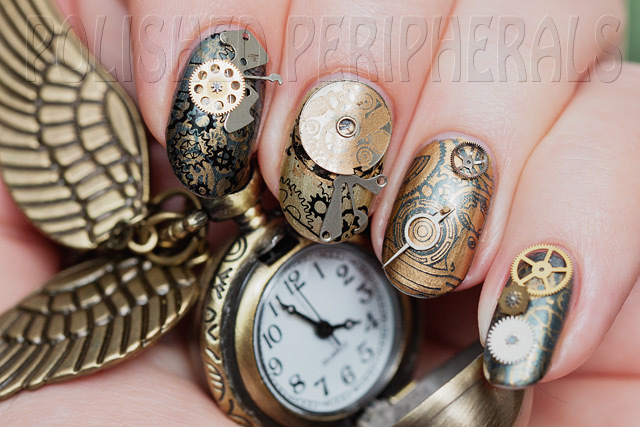 This year is a little different, we are featuring Nail Vinyls. 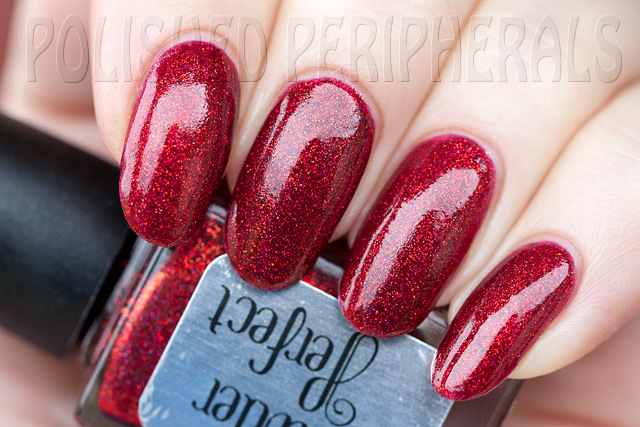 piCture pOlish have just released a special 4 pack exclusive of 'NailVinyls' from the US, available here. This year is also an insta fest so you can check out more pics on instagram using #picturepolish and you can follow my IG @reblr. There is also two parts to this blog fest. 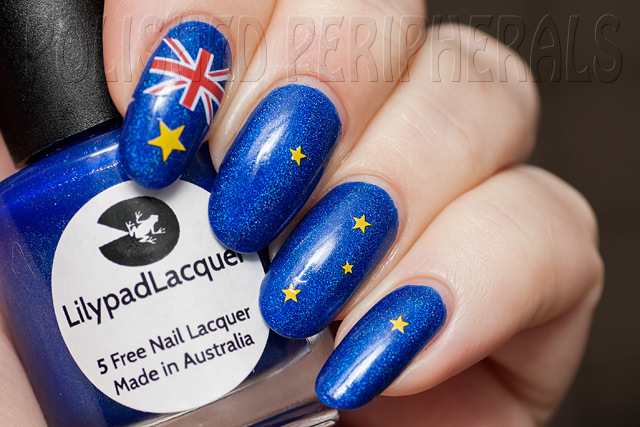 The first is a straight forward swatch and review of a supplied polish, no nail art, and the second task is to create a nail art project using the supplied Nail Vinyls and polish. 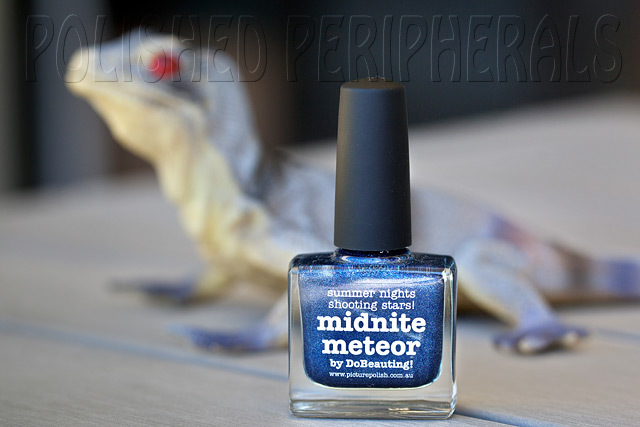 So first up here's piCture pOlish Midnite Meteor. 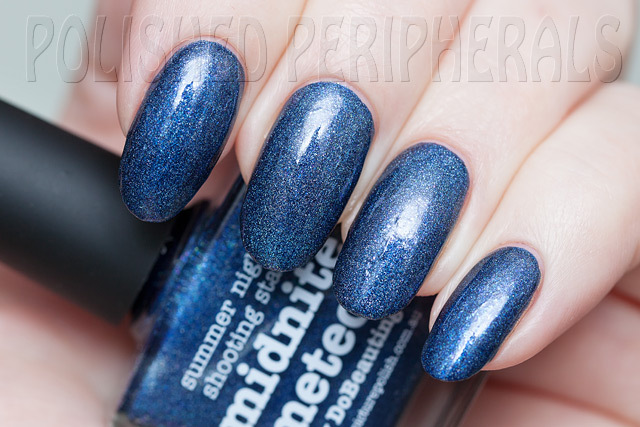 Midnite Meteor is a collaboration shade with DoBeauting! 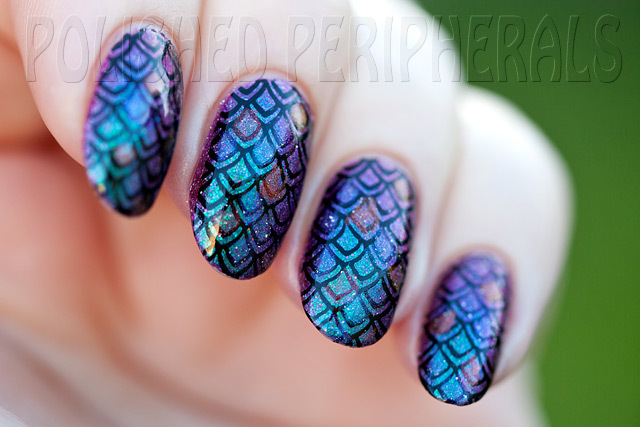 It's a dusty navy blue with scattered bijou holo and coloured flecks. The holo and flecks of colour are subtle. In the sun holo is most visible, in shade it's the coloured flecks that catch the eye with little flashes of magenta and blue, but it's the formula that is the stand out feature of this polish. It's a one coat wonder! Smooth and completely opaque in just one normal coat and I love a good one coat polish. See that's just one coat. It's shiny too. I applied top coat to just two of those nails and couldn't see the difference. Wow, one coat without the need for top coat, yep I can use that. 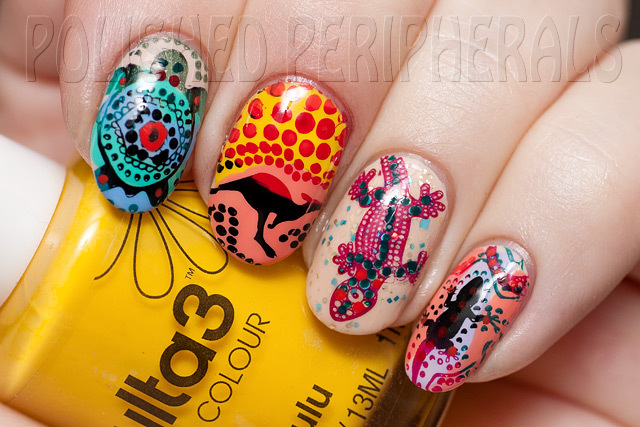 Even more impressive is that underneath I was wearing some nail art with black and white stamping. I applied a coat of Midnite Meteor to just one nail to test it and I was so impressed with the way it covered the nail art I had been about to soak off (gel polish) that I went ahead and did a full manicure and took photos. I felt so lazy but it was the perfect quick and easy solution that I wore for another 3 days. Easy to apply too, not to thick and no risk of cuticle flooding. I didn't need to do any clean up. 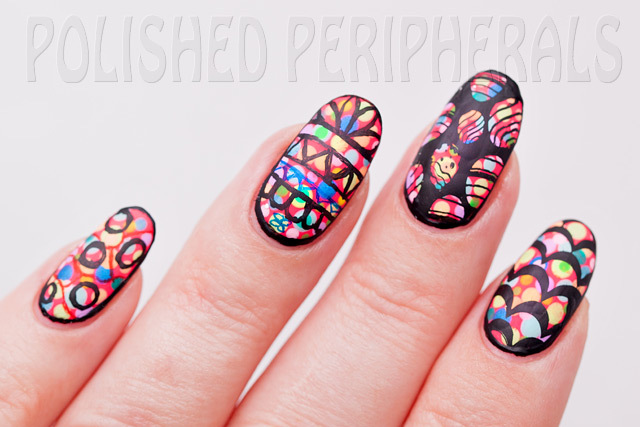 It's going to be great for nail art and I intend to test it for stamping. There was a full sheet of Nail Vinyls but I used a lot testing designs. 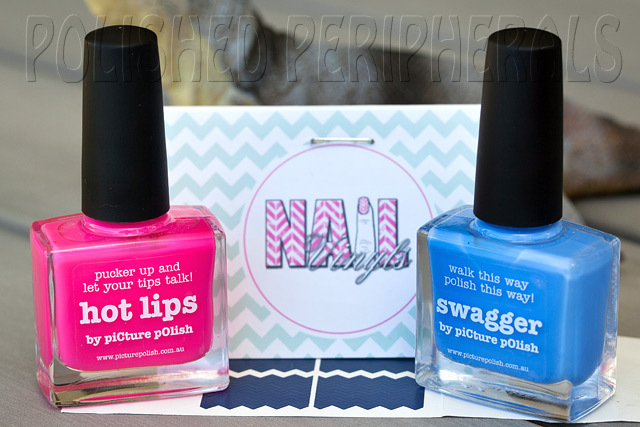 Next we have piCture pOlish Hot Lips, a bright neon pink, and Swagger, a milky periwinkle blue. 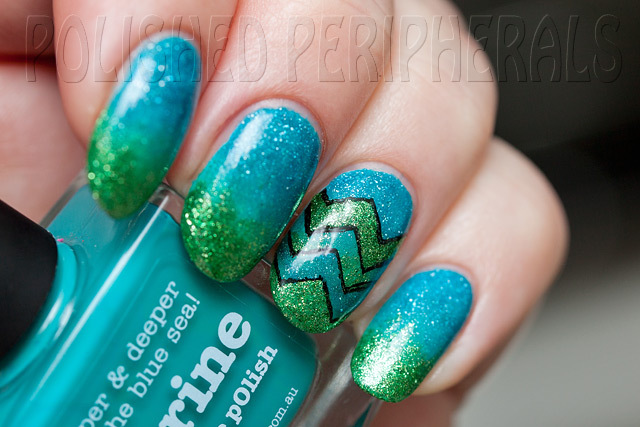 The Nail Vinyls I received are mini chevrons. Hot Lips and Swagger look great together, quite summery, not at all like our current rainy weather in Sydney. I found Hot Lips to be a two coater and for Swagger I needed three coats for an even, opaque finish. Which made the next task a bit tricky. We were instructed to create nail art featuring the Nail Vinyls using the supplied two colours and NO studs, stamping, decals, stickers, tape, acrylic paints or any other nail art, ie gradients and dots. We could use black and white polish if needed but these colours and the vinyls were to be the focus. My first inspiration was to do a gradient under the Vinyls. I think these colours would make a nice gradient but it wasn't an option so I'll save that idea for another day. 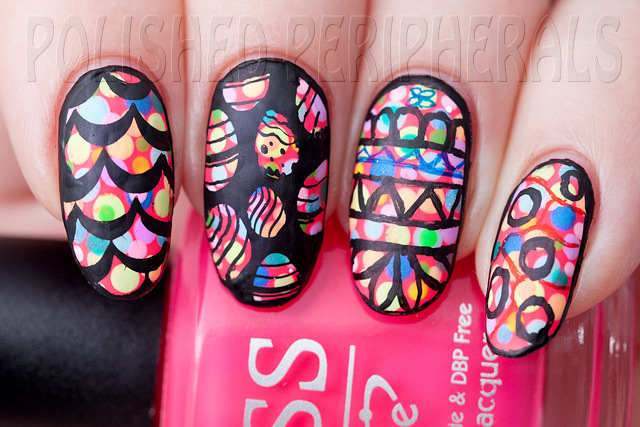 Nail Vinyls are basically vinyl stickers, used like striping or masking tape to stencil designs with polish. Easier to handle than striping tape and stronger than masking tape, with precut shapes to make stencil style nail art easier. 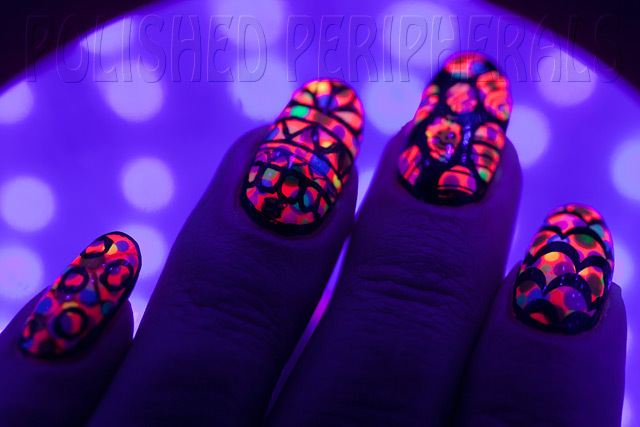 You stick the vinyls on your nails, paint over with a coat of polish then peel them off while the polish is still wet, leaving behind your (hopefully) crisp clean shapes. yes that is a horribly stained ring finger nail. Ideally you need a nice opaque one coat colour to paint over the vinyls and the problem I had was both the supplied polishes needed more than on coat. Multiple coats or too thick a coat caused the vinyls to 'melt' on the edges and leave a mess of glue behind. My husband thinks this looks like a blue cockroach. This is over a bare nail and you can see the glue left behind because I applied the polish too thick. I tried many different combinations and designs and I kept having sticky problems. In the end I found pressing the vinyls on my skin a few times to reduce the stickiness first helped and I had to settle for the base colour showing through each top colour because I just couldn't get them opaque in one coat. You can see the blue Swagger under Hot lips has turned the neon pink into more of a fucshia colour on my index and ring fingers and on my middle and little fingers where I used Hot Lips as a base colour it has given Swagger more of a lilacy tint. The top colours are also patchy on each so the base is showing through unevenly and I still had ragged edges from applying the top colour too thickly. To finish off the mess my top coat made the colour streak over the chevrons, even though the polish was completely dry before I top coated. I wasn't happy but this was the best result I had. I tried things like using white as a base coat which made the colours 'pop' nicely but still didn't get around the need for more than one coat. 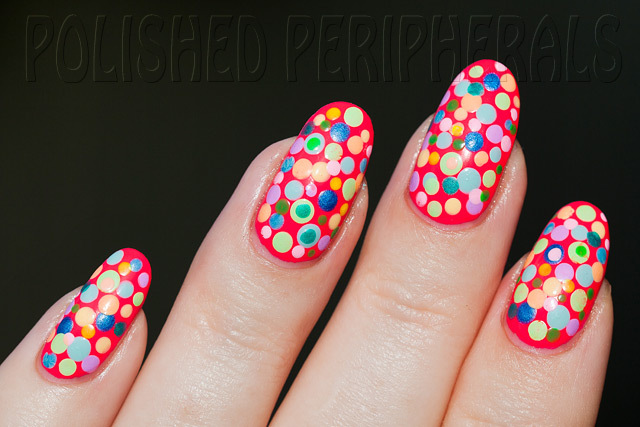 A polish like Midnite Meteor would have been perfect for this but I could only used Swagger, Hot Lips and black & white. So I slept on it. The next day I added another layer of chevrons using a rich one coat black I made myself. Even the reflections look zigzaggy. On my middle finger I left the vinyls on and top coated them, I like that nail best, it's kind of 3D. 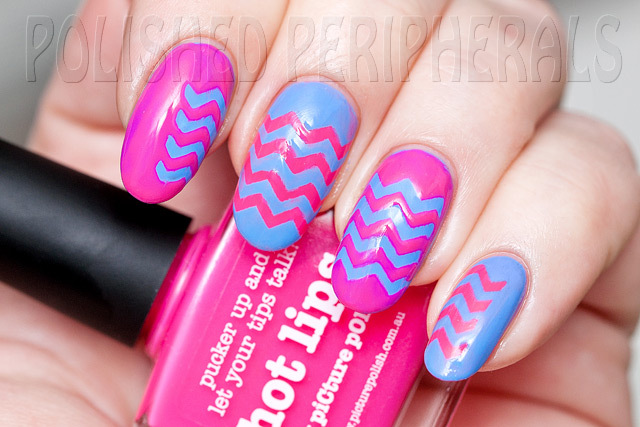 Hot Lips and Swagger are both beautiful colours and make great base colours for this kind of nail art but for Nail Vinyls a one coat colour would give much neater results. I'm going to use my remaining mini chevrons with Midnite Meteor. If you'd like to see more Nail Vinyl art (and polish) check out what the other piCture pOlish Blog Fest 2014 participants have created. 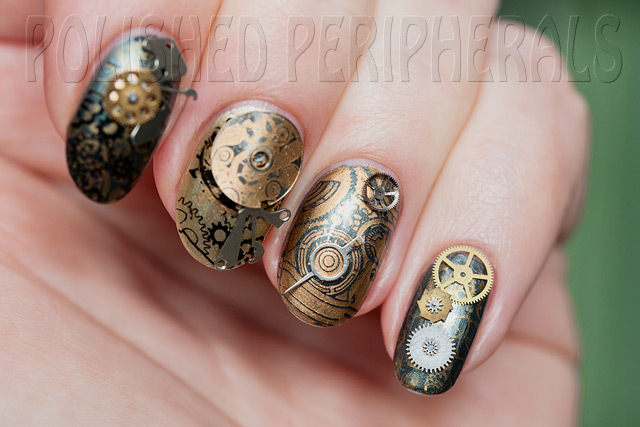 Today I did a bit of steampunking. I started with a base of Picture Polish Warehouse and BarryM Gold Foil Effects. Stamped with the new Messy Mansion MM43 plate in black, gold and copper, and added some watch parts. The largest watch part was too reflective on it's own so I stamped over it. This is of course totally impractical but it was fun to do and lasted surprisingly well. I don't think it's something I'm brave enough to wear while cooking, cleaning or washing my hair. 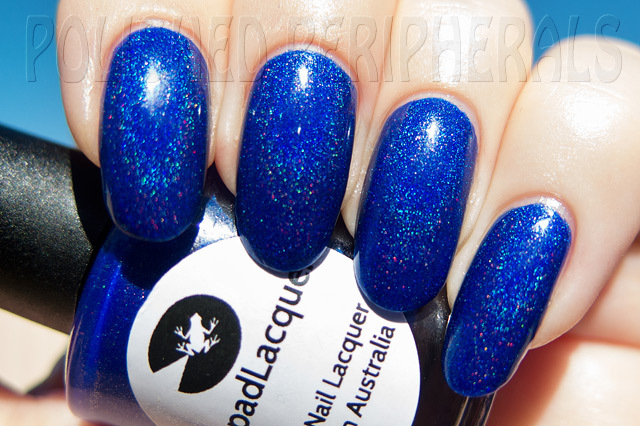 Lilypad Lacquer A Balt Out Of The Blue is blue holo perfection! 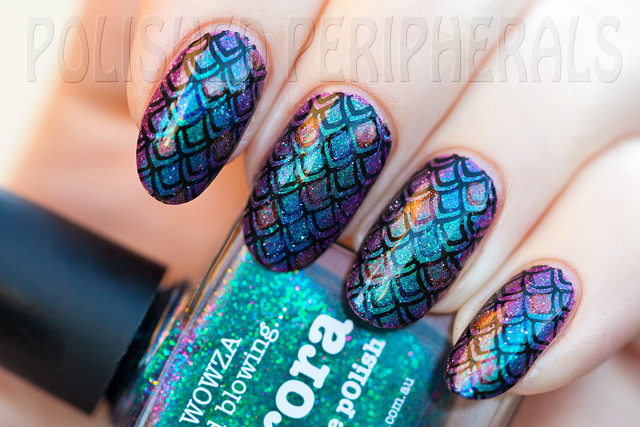 It's smooth, rich and has just the right amount of scattered holo that doesn't dull the blue. The holo is visible indoors but the rainbows really come out to play in the sun. I was worried the colour was so rich that it would stain but I had no staining with Orly Bonder as my base coat. I've been wanting to try the Moyou Sci-fi 05 plate for a while now. 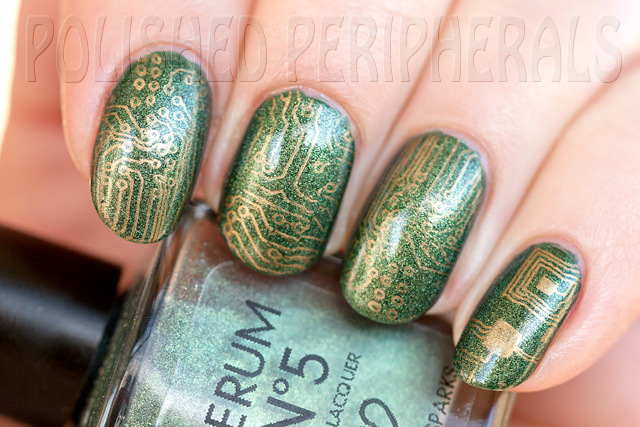 I wanted a classic gold on green circuit board look with a twist. So I used Serum No5 Twilight Sparks as the base colour, it glows in the dark :) I was so keen to stamp I didn't get any photos of Twilight Sparks first and I haven't tried a shot in the dark yet but it glows green. 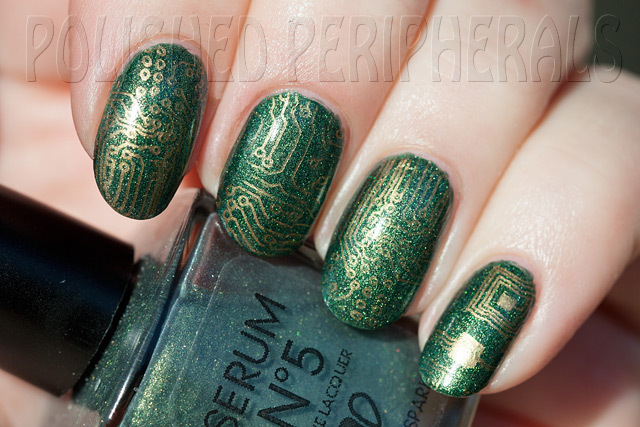 The stamping polish is a Mundo de Uñas gold. 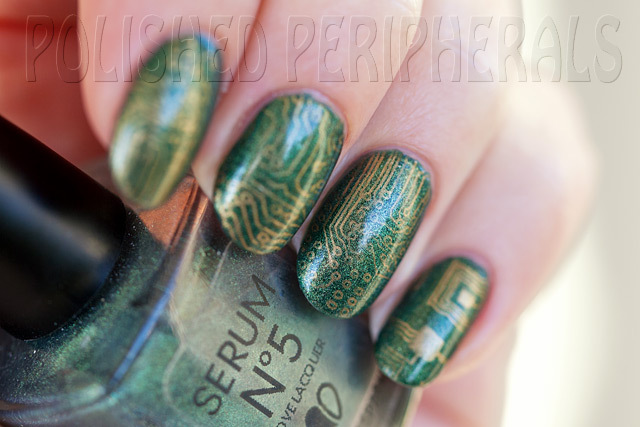 Unfortunately with the gold shimmer in the base colour the stamping didn't stand out as much as I wanted. Twilight Sparks dries to a slightly rough matte finish but a top coat really brings out the shimmer. Here's a little something I did for Easter. I started with Joss Not That Shy. A beautiful smooth neon pink that's so bright it's hard to photograph. This was a mix of Picture Polish, Ulta3 and Lime Crime colours. I know it doesn't show in the photos but those are mostly neon colours. Finished with some black stamping from Messy Mansion MM08 on my first two nails and hand drawn details on the other nails. Then I outlined them all in black and finished with a coat of Picture Polish G'day Matte. 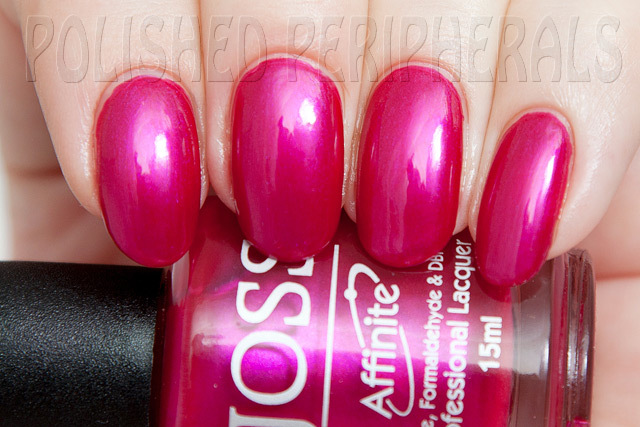 The neon pink Joss colour glows under UV but it will stain without a good base coat. More random photo spam. This time it's stamping practice. stamped with Mundo de Uñas stamping polish and Pueen plate 30 and Moyou Rebel 03.
and Picture Polish Gravity, Illusionist and Solar Flare added to random scales. 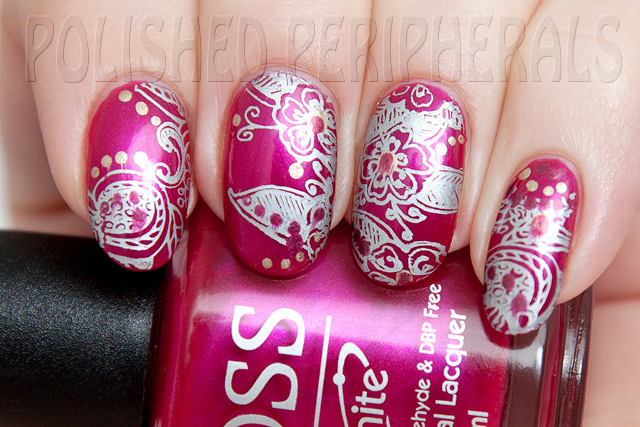 stamped with Mundo de Uñas stamping polish and Messy Mansion plate MM20. Just a test of the MJ12 plate with Mundo de Uñas stamping polish. 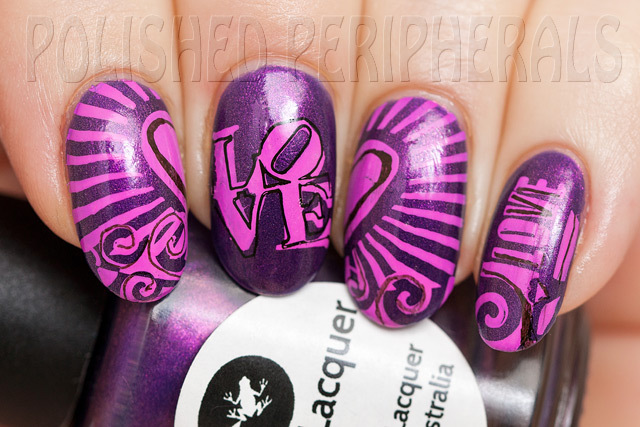 stamped with Mundo de Uñas stamping polish and Moyou Pro 06. This was to test different top coats to see which would/wouldn't smudge stamping. 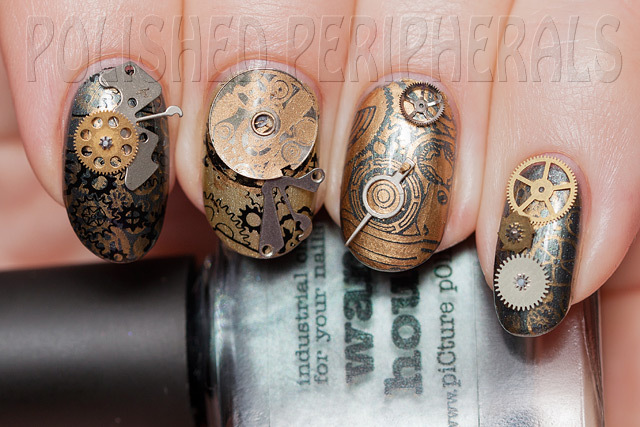 The stamping survived but the dots of different polishes all smudged so there was no clear winner. 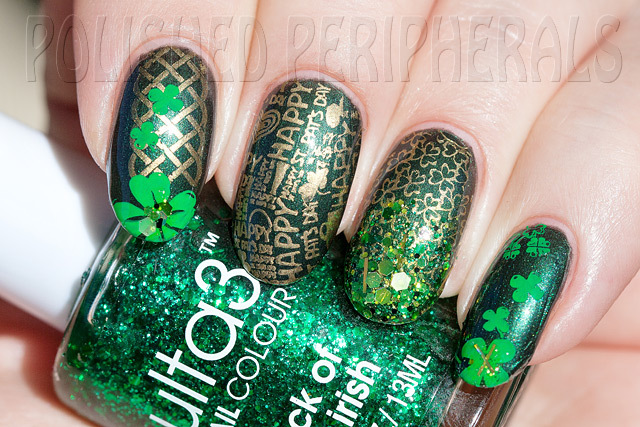 and Ulta3 Luck of the Irish.